The Dells were one of the longest-lasting of all the many R&B vocal groups which had their roots in the gospel and doowop era of the early and mid-‘50s, their career encompassing a heyday in the soul era of the ‘60s and ‘70s and extending well unto the new millennium until the death of Johnny Carter in 2009. Formed in 1952, they made their first record as The El Rays in 1954, becoming The Dells in 1955 when they moved to the Vee Jay label. This 29-track collection comprises the A and b sides of all their releases from the debut on Checker, through their time with Vee Jay, which gave them their debut hit with “What A Night” in 1956, and including their two singles for Checker’s Argo subsidiary in 1962. 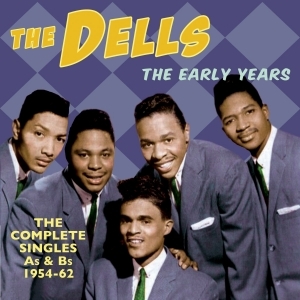 Unlike many ensembles of their era, The Dells maintained a more or less completely settled line-up throughout their career, with just one change in 1960 when Carter replaced Johnny Funches, following a near-fatal car crash. This collection provides an entertaining and enjoyable trawl through their early career, charting the course which saw them develop into archetypal soul legends.